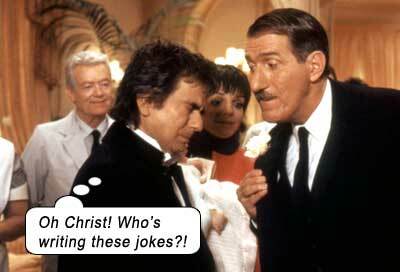 Dudley Moore returns as Arthur Bach, the millionaire who loves a tipple at all hours of the day. He’s not an alcoholic, he’s a drunk. He’s still lovable, but just barely, and his hijinks are producing in those around him television sitcom reactions rather than big screen comedy. Five minutes in, and Arthur’s wife Linda (Liza Minelli) is talking adoption (because she can’t get pregnant). You know you’ve just lost every single male in your audience, don’t you, writer Andy Breckman and director Bud Yorkin? Relentless, the filmmakers plough on, every single word out of Linda’s mouth from now until movie’s end baby-talk, baby-wallpaper, baby-names, baby-nursery, baby-toys, and I jumped out a window and ran screaming down the street. Like every red-blooded male. Then Arthur is bankrupted by his nemesis Burt Johnson (Stephen Elliott), the only way to recover his fortune being to marry Johnson’s vindictive daughter Susan (insipid Cynthia Sikes replacing insipid Jill Eikenberry from the last movie). Arthur and Linda try to brave the poverty and get jobs, they try moving to different hovels, but Burt Johnson is dogging their every move and thwarting all their efforts. Just when things are looking their worst, Arthur and Linda get a surprise visit from that terrible actor from the adoption agency – and all hope of even a baby to brighten their existence is dashed…When they break up, Arthur ends up in a hostel. Every element that made ARTHUR a spirited adventure is leached from this plodding, confused thought experiment. Even Arthur’s imperious, imposing butler/father figure Hobson is dead (Sir John Gielgud in the last movie), replaced with a humorless patsy in the form of Paul Benedict as Fairchild. And the supporting cast all prove they’re willing to say anything to pick up a paycheck. In the hostel, at the film’s lowest ebb, it is suddenly defibrillated uproariously with the appearance of – Sir John Gielgud as Hobson’s ghost! The filmmakers were probably kicking themselves that this character died in the last film, because as soon as Gielgud’s commanding presence is onscreen, ARTHUR 2 springs back to life. Alas, too little, much too late. Worst of all, the message this movie is trying to convey – that you don’t need money to be happy – is undermined in exactly the same way that ARTHUR’s message was undermined – by having Arthur reclaim his fortune almost magically AND by having that bad actor deliver an adoption child AND by having Linda announce she is pregnant as well! Oh, it’s such fun how everything always works out when you’re rich and in love and drunk and can’t write a good screenplay. Writers: Steve Gordon, Andy Breckman. Starring: Dudley Moore, Liza Minnelli, John Gielgud, Geraldine Fitzgerald, Stephen Elliott, Paul Benedict, Cynthia Sikes, Kathy Bates, Jack Gilford, Ted Ross, Barney Martin.